The word missionary invokes all types of images: “super Christians” traveling (flying if they have capes) to a foreign land to do the Lord’s work, hypocrites trying to browbeat natives into western civilization via Christianity (think The Poison Wood Bible), saintly people who never get angry or upset, who don’t have a selfish bone in their body. I struggle with what to call myself, for I too grapple with the term missionary. I have a South African friend who vehemently dislikes the word because it reminds her of the awful mission schools run by missionaries during the apartheid days. I have other South African friends (both coloured and African) who insist that the term has evolved and no longer carries the negative connotation; on the contrary, it is seen in a positive light. Added to these considerations, I too have stereotypes about missionaries that I need to let go. Missionary or cross-cultural Christian worker. Hum? These days the later is the more politically correct term. Perhaps it’s the most accurate term; but let’s be real, it’s a mouthful. Maybe I could shorten it to CCCW or C2CW or something cute like C2CW. What I call myself will probably depend on the audience. As of now, I will continue to use both terms to describe myself. I imagine a term will evolve organically, once I settle into South African life. However, if I had my way, I would use no special term. I’m merely a Christian trying to live out her faith, and I often fall short. God has just called me to live out my faith in South Africa for a few years. It took me quite a while to muster up enough courage to meet with my priest about my sense of call to do mission work. I knew once I confided in him, I would truly have to examine if this was a God-calling or not. I was still scared that it might be. Periodically, over the next year and a half, we would meet together to pray and talk. His gentle guidance and prayerfulness was exactly what I needed. I felt encouraged. In the fall of 2010, we felt as though it was time for me to move forward, and I entered a formal discernment process at my church. For the next eight months, I met with a body of faithful and prayerful parishioners who had committed to serve on my discernment committee to help me determine whether or not God was calling me to mission work. Working with this committee was a humbling experience, as I had to be vulnerable, totally honest about my spiritual journey and life. But having a group of people walk this journey with me for many months has been one of the greatest gifts of my life. There was a general consensus from the committee that God was calling me to mission work in South Africa, so I continued to move forward and the discernment committee morphed into a sending a committee. There were so many details to work out, and I felt a bit overwhelmed: with which mission agency should I go, and what type of work should I do? Although I had a desire to work with young people and to use my publishing skills, I really didn’t have a clear sense of direction of the type of work God was calling me to do. It took God a while to work out the details, but God was at work behind the scenes in amazing ways. In the words of a new friend, “When we say ‘yes’ to God, he takes over and takes care of the rest.” I feel like this is so true of my journey. Once I said yes to God—“yes, God, I’m willing to go”—God took over, taking care of the details. NOTE: This is the third post of a three-part series that recounts my discernment process to become a cross-cultural Christian worker in South Africa. In the fall of 2007, I returned to South Africa. This time I went on a outreach trip with my church. 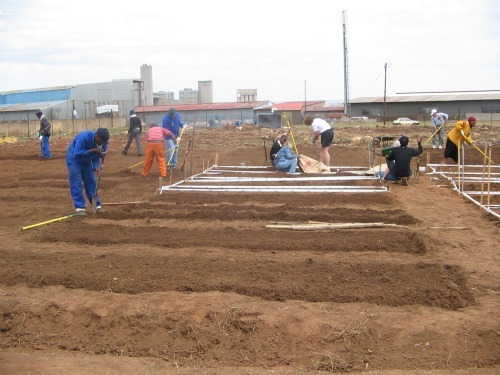 We helped our “sister church” with their ministries by planting a garden to help support their feeding scheme, in which they feed 200 orphans a healthy meal once a week. We also helped to build a new home for a family of six who lived in a nearby informal settlement. I have never felt more fully alive as I worked on these projects and interacted with the South African people. I felt a deep-rooted joy like I have never experienced. 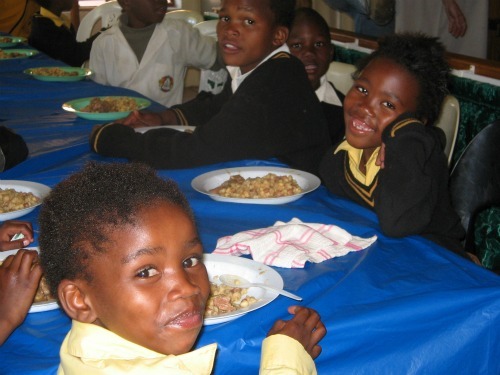 I was blessed to return to South Africa several more times on outreach trips, and each time I had this same sense of joy. Sometimes it was so hard to come back home. As the plane left South African soil, I would feel as though a part of me was being ripped apart, being left behind in South Africa. For many reasons I ended my engagement; and at the same time, I decided I needed to pay attention to this nudge that wouldn’t go away. In the following weeks, I went through an epiphany. I know this sounds nerdy (hey, I embrace my inner-nerdiness), but I distinctly remember spending a few evenings thinking and writing about my life, the American life, and the life we are called to live as Christians: The American way of life is one big cycle. Where’s the meaning in it? Our parents work hard. Why? So that we can we attend good schools, be involved in activities, be well-rounded. Why? So that we’ll get into a good college. Why? So that we’ll land good jobs. Why? So that we’ll marry, have a family, and work hard. Why? So that our kids will attend good schools. . . One reason I broke up with my fiancé was that I felt boxed in, confined, stifled. I was getting trapped into this cycle of life I didn’t want. I wanted out. Let me be clear, there is nothing wrong with marriage and a family (and yes, I still want these things for myself), but I feel as though God wants much more for us than that—whether we’re married or single. (Yes, even singles fall prey to a similar cycle of life.) I believe God wants us to step outside the cycle and to make a difference in our little corner of the world. Through Jesus Christ, we have abundant life, and God wants us to enjoy it. I think we often sell ourselves short. After a few weeks of my philosophical and theological musings, I started to carve out some intentional time of prayer. If God was calling me to do outreach work in South Africa, I wanted to be certain. Packing up and moving away from my family, friends, and comfortable way of life to live halfway around the world was no small thing! I wanted to make sure that it was God’s voice I was hearing and not my own. I spent a lot of my prayer time reading “calling stories” in the Bible—Abraham and Sarah, Gideon, Jonah, Jeremiah, the Twelve. I would end my prayer time listening in silence, which was hard for me. A billion thoughts raced through my mind, and I often fell asleep. But I felt I needed this time of silence to listen to God, since I don’t have much silence in my life. It would have been easy for God’s voice to get drowned in the noise of my life. Turning aside to pay attention to this nudge to do outreach work in South Africa was both exciting and scary. A few days into 2009, I mustered up enough courage to meet with my priest. “I believe God is calling me to be a missionary in South Africa,” I said. NOTE: This is the second post of a three-part series that recounts my discernment process to become a cross-cultural Christian worker in South Africa.